Mindfulness training is known to be able to lower blood pressure. So, it is possible that meditation practice may be useful in the treatment of glaucoma. In today’s Research News article “Mindfulness Meditation Reduces Intraocular Pressure, Lowers Stress Biomarkers and Modulates Gene Expression in Glaucoma: A Randomized Controlled Trial.” (See summary below or view the full text of the study at: https://eyewire.news/articles/study-meditation-an-effective-therapy-to-reduce-eye-pressure-in-primary-open-angle-glaucoma/), Dada and colleagues recruited patients with open-angle Glaucoma who were being treated with prescription eye drops and randomly assigned them to either receive a 3 week, once a day for 60 minutes, program of meditation and yogic breathing exercises or to a wait-list control condition. They were measured before and after treatment for intraocular pressure, quality of life, stress-related serum biomarkers [cortisol, β-endorphins, IL6, TNF-α, brain-derived neurotrophic factor, reactive oxygen species, total antioxidant capacity], and whole genome expression. They found that in comparison to baseline and the wait-list control that the Glaucoma patients who meditated had significantly lower intraocular pressure and stress-related serum biomarkers and significantly improved quality of life. Additionally, meditation significantly reduced the levels of the stress hormone, cortisol levels and increased the levels of beta-endorphins and brain-derived neurotrophic factors and reduced the levels of the pro-inflammatory markers, interleukins. In addition, the greater the decrease in intraocular pressure the greater the improvements in quality of life and the stress-related serum biomarkers. These changes correlated well with gene expression profiling. These are exciting results that suggest that meditation may be a safe and effective treatment for Glaucoma. 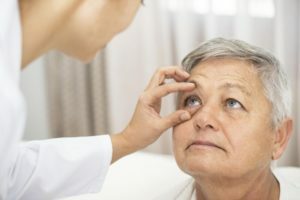 The reduction in intraocular pressure may reduce further damage to the optic nerve and help to preserve the remaining vision of the patients. Further the reduction in stress hormones and inflammation suggests an overall improvement in the patient’s health. So, improve glaucoma with meditation. Background: Reducing intraocular pressure (IOP) in primary open-angle glaucoma (POAG) is currently the only approach to prevent further optic nerve head damage. However, other mechanisms such as ischemia, oxidative stress, glutamate excitotoxicity, neurotrophin loss, inflammation/glial activation, and vascular dysregulation are not addressed. Because stress is a key risk factor affecting these mechanisms, we evaluated whether mindfulness-based stress reduction can lower IOP and normalize typical stress biomarkers. Materials and Methods: In a prospective, randomized trial 90 POAG patients (180 eyes; age above 45 y) were assigned to a waitlist control or mindfulness meditation group which practiced daily for 21 days. We measured IOP (primary endpoint), quality of life (QOL), stress-related serum biomarkers [cortisol, β-endorphins, IL6, TNF-α, brain-derived neurotrophic factor (BDNF), reactive oxygen species (ROS), total antioxidant capacity (TAC)], and whole genome expression. Results: Between-group comparisons revealed significantly lowered IOP in meditators (OD: 18.8 to 12.7, OS 19.0 to 13.1 mm Hg) which correlated with significantly lowered stress-biomarker levels including cortisol (497.3 to 392.3 ng/mL), IL6 (2.8 to 1.5 ng/mL), TNF-α (57.1 to 45.4 pg/mL), ROS (1625 to 987 RLU/min/104 neutrophils), and elevated β-endorphins (38.4 to 52.7 pg/mL), BDNF (56.1 to 83.9 ng/mL), and TAC (5.9 to 9.3) (all P<0.001). These changes correlated well with gene expression profiling. Meditators improved in QOL (P<0.05). Conclusions: A short course of mindfulness-based stress reduction by meditation in POAG, reduces IOP, improves QOL, normalizes stress biomarkers, and positively modifies gene expression. Mindfulness meditation can be recommended as adjunctive therapy for POAG.